Click on any of the activities below for pricing and related details. If you have questions about pricing, please contact us at (239) 765-0965 or send us a message from our contact page. If you’re ready to request a reservation, complete the form on this page. Rentals include freestyle riding within boundaries and you may ride single, double or triple- no rider fees! Any age may ride with a licensed driver. Important: All waverunner drivers must be 16 or older. If born after January 1, 1988 they must have a photo ID and a boating safety license. There are three ways to get your license. 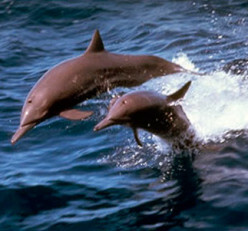 Dolphin Tours are conducted in the morning. These are the best times for dolphin viewing. Please arrive at our booth by 9:30 A.M. on your reservation day. Best Tour Location on the island!! Get up close and personal with our beautiful island! 1 ½- 2 hr hour guided waverunner dolphin tours. Your tour guide will drive a waverunner and you will drive your own and follow along. You can go single or you may have up to two riders. Great for most ages. This 18-20 mile round trip eco-tour allows you to explore the back bay, local plant/wildlife and even dolphin while experiencing the thrill of a waverunner ride. This is our most popular activity for good reason. All ages absolutely love this trip!! Our location on the beach is the closest to the dolphin and wildlife areas so we spend more time in the areas you want to be in!! Important: Dolphin Tours can fill up several days ahead of time. This is our most popular activity and for good reason. Don’t miss out!!! Tours leave from both locations. Flight prices are per person. Fly single, double or triple!! 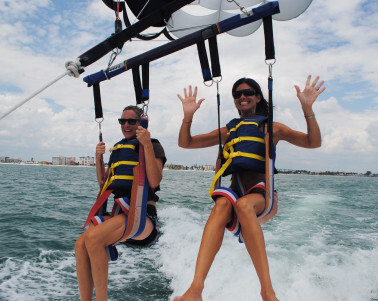 $80 Magnum – 10 minutes in the air, up to 1200 feet of line is deployed, you get a dip. $20 Observers – Ride along when there is an extra spot on the boat! Please remember that we can take 6 passengers per boatload and flyers have priority over observers. $30 Photo Opportunities – The crew will shoot 20 plus high-quality digital photos, one video of your controlled dip, and you will be given the SD card to take home. One package is to be used per flight. Important: Max weight per flight is APPROXIMATELY 450 lbs. This can vary due to wind changes. The captain always makes the final decision on the boat for flight configurations. We accept Cash, Visa, Master Card and Discover for the above items. You are welcome to tip on the credit card during sign up or you may wish to do your tipping in cash on the boat. Includes a personal Cabana with hood or 2 Chairs and an Umbrella. Available all Mid Island Watersports locations. Stand up paddle-boards are only available at our Sandpiper location.